The production of wine begun in Burgundy when the Roman invaded the region. Later, during the sixth century one of the nearby kings gave his vineyards to the church. 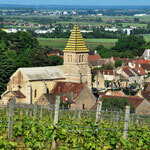 At the time of the French Revolution most of the best Burgundy wines where produced by monasteries. 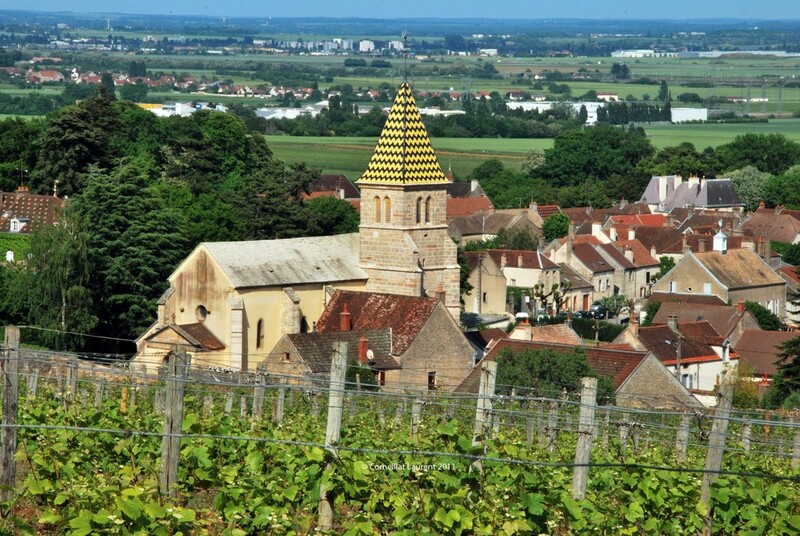 Monks and monasteries of the Roman Catholic Church have had an important influence on the history of Burgundy wine. The first known donation of a vineyard to the church was by king Guntram in 587, but the influence of the church became important in Charlemagne's era. The Benedictines, through their Abbey of Cluny founded in 910, became the first truly big Burgundy vineyard owner over the following centuries. Another order which exerted influence was the Cistercians, founded in 1098 and named after Cîteaux, their first monastery, situated in Burgundy. The Cistercians created Burgundy's largest wall-surrounded vineyard, the Clos de Vougeot, in 1336. More importantly, the Cistercians, extensive vineyard owners as they were, the first to notice that different vineyard plots gave consistently different wines. 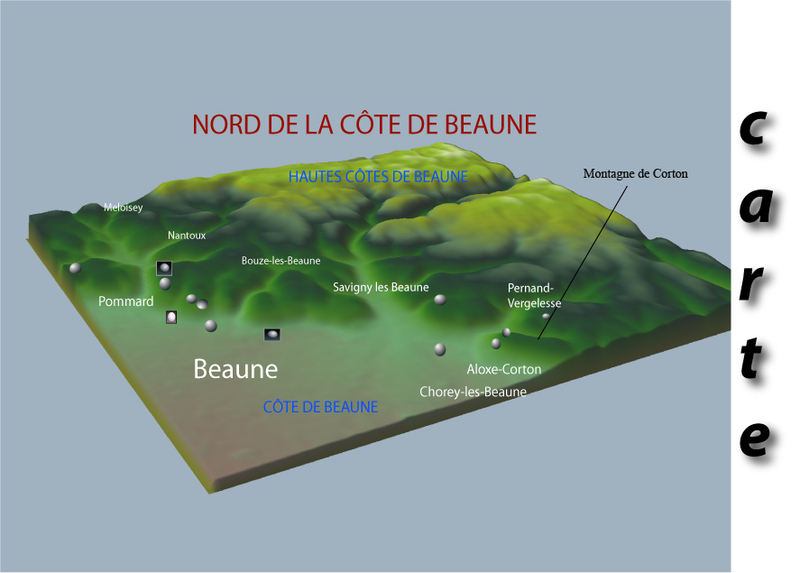 They therefore laid the earliest foundation for the naming of Burgundy crus and the region's terroir thinking. Monks maintained vineyards and, more important, wine making knowledge and skills during that often turbulent period. Monasteries had the resources, security, and motivation to produce a steady supply of wine for both celebrating mass and generating income. During this time the best vineyards were owned by the monasteries and their wine was considered to be superior. Over time the nobility acquired extensive vineyards. The status of Burgundy wines continued in the court of the House of Valois, which ruled as Dukes of Burgundy for much of the 14th and 15th centuries. 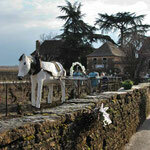 It is from this era we have the first reliable reference to grape varieties in Burgundy. Pinot Noir was first mentioned in 1370 under the name Noirien, but it is believed that it was cultivated earlier than that, since no other grape variety associated with Medieval Burgundy is believed to have been able to produce red wines of a quality able to impress the papal court. 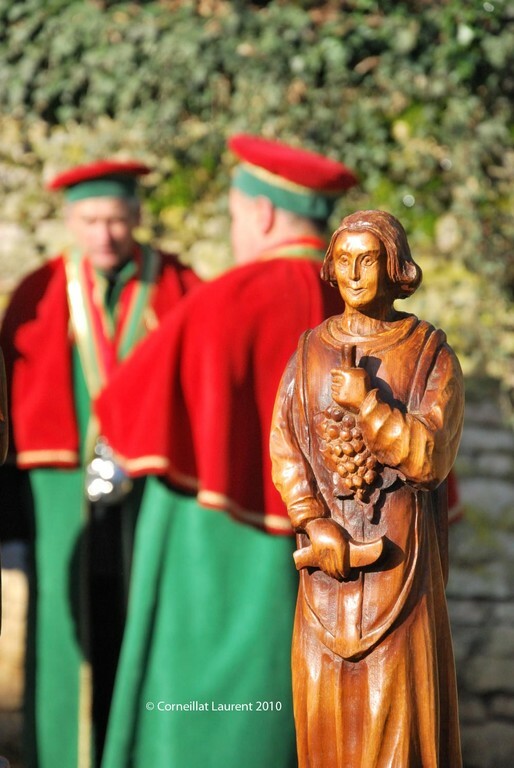 On August 6, 1395, Duke Philip the Bold issued a decree concerned with safeguarding the quality of Burgundy wines. The duke declared Gamay, which was a higher-yielding grape than Pinot Noir in the 14th century as it is today, unfit for human consumption and banned the use of organic fertilizer (manure), which probably increased yields even further to the detriment of quality. 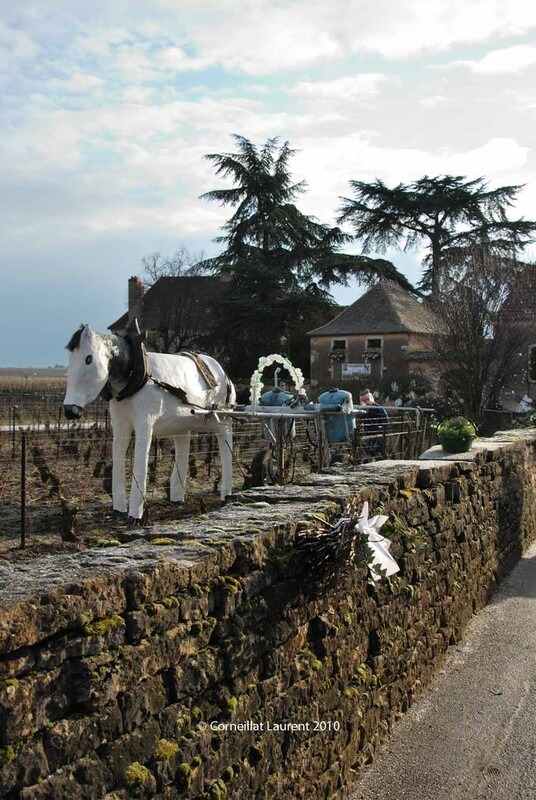 High-quality white Burgundy wines of this era were probably made from Fromenteau, which is known as a quality grape in northeastern France in this time. Fromenteau is probably the same variety as today's Pinot Gris. 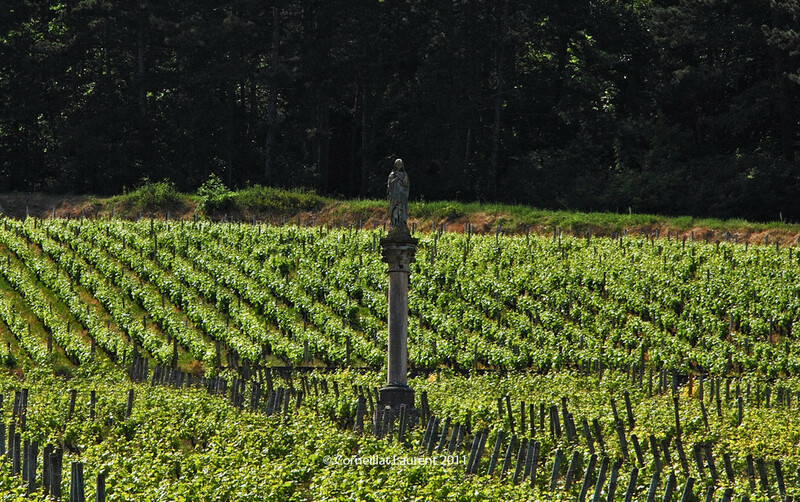 Chardonnay is a much later addition to Burgundy's vineyards.In the 18th century, the quality of roads in France became progressively better, which facilitated commerce in Burgundy wines. Burgundy and Champagne were rivals for the lucrative Paris market, which Champagne had earlier access to. 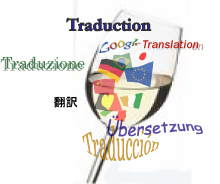 The two regions overlapped much in wine styles in this era, since Champagne was then primarily a producer of pale red still wines rather than of sparkling wines. After Burgundy became incorporated in the Kingdom of France, and the power of the church decreased, many vineyards which had been in the church's hands were sold to the bourgeoisie from the 17th century. After the French revolution of 1789, the church's remaining vineyards were broken up and from 1791 sold off. 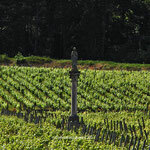 The Napoleonic inheritance laws then resulted in the continued subdivision of the most precious vineyard holdings, so that some growers hold only a row or two of vines. This led to the emergence of négociants who aggregate the produce of many growers to produce a single wine. It has also led to a profusion of increasingly small family-owned wineries, exemplified by the dozen plus "Gros" family domaines. The awareness of the difference of quality and style of Burgundy wines produced from different vineyards goes back to Medieval times, with certain climats being much highly rated than others. In 1855, the same year as the famous Bordeaux Wine Official Classification was launched, Dr. Jules Lavalle published an influential book which included an unofficial classification of the Burgundy vineyards. when the national AOC legislation was implemented in 1936. Burgundy wine has experienced much change over the past seventy-five years. Economic depression during the 1930s was followed by the devastation caused by World War II. After the War, the vignerons returned home to their unkempt vineyards. The soils and vines had suffered and were sorely in need of nurturing. Those who could afford it added potassium, a mineral fertilizer that contributes to vigorous growth. The growers began to fertilize, bringing their vineyards back to health. By the mid-1950s, the soils were balanced, yields were reasonably low and the vineyards produced some of the most stunning wines in the 20th century. Understandably, the farmers had no inclination to fix what wasn't broken. So for the next 30 years, they followed the advice of renowned viticultural experts, who advised them to keep spraying their vineyards with chemical fertilizers, including potassium. While a certain amount of potassium is natural in the soil and beneficial for healthy growth, too much is harmful because it leads to low acidity levels, which adversely affect the quality of the wine. As the concentration of chemicals in the soil increased, so did the yields. In the past 30 years, yields have risen by two-thirds in the appellations contrôlées vineyards of the Côte d'Or, from 29 hectoliters per hectare (yearly average from 1951 to 1960) to almost 48 hectoliters per hectare (1982-91), according to a study by the Institut National des Appellations d'Origine. The period between 1985 and 1995 was a turning point in Burgundy. During this time almost Burgundian domaines renewed efforts in the vineyards and gradually set a new course in winemaking. All this led to deeper, more complex wines. 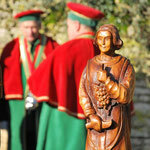 Today, the Burgundy wine industry is reaping the rewards of those efforts.